Grace has always been fully involved in the farm. The spirit of entrepreneurship and the business mind that she developed at an early age led to her own business. At age nine, she decided to fill the unexpected void left at the farmers market when the market’s flower vendor suddenly departed. 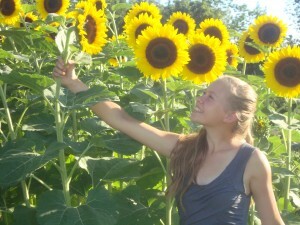 With great urgency and enthusiasm Grace started growing and supplying the market with sunflowers. Her business has grown significantly during the past nine years. Grace now offers a devoted group of customers at the Pleasantville Farmers Market more than ten varieties of sunflowers available June through October. Grace’s sunflower’s can also be purchased directly from the farm.